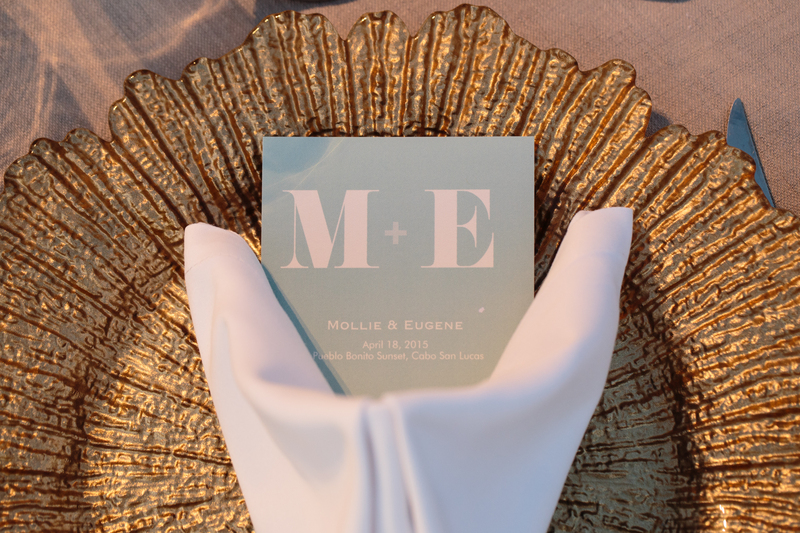 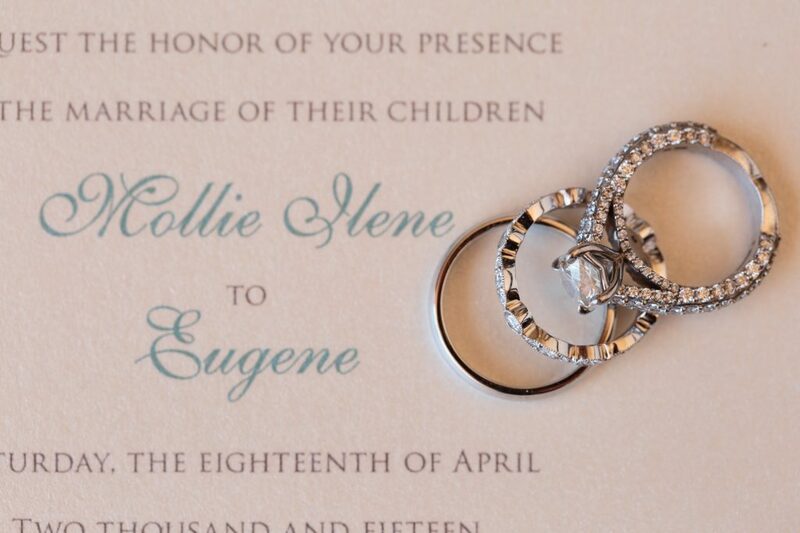 Mollie and Eugene have been together since 2012 and right away knew it was going to be serious. 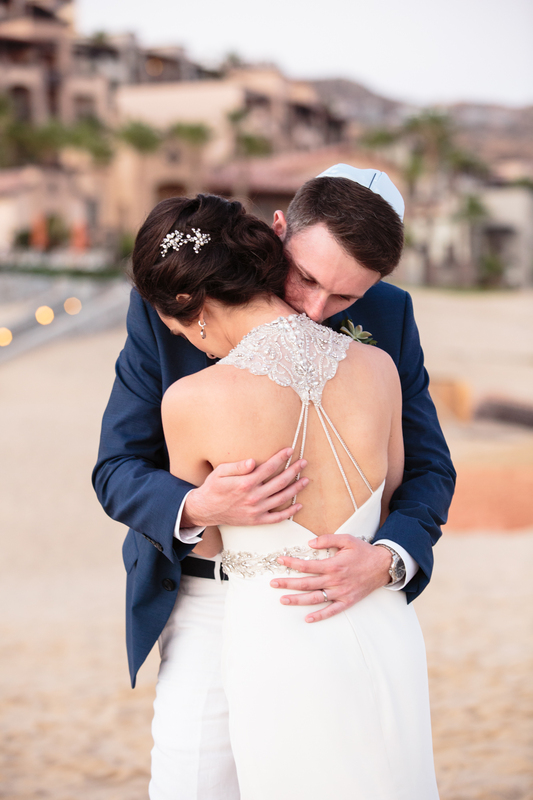 They met at a wedding and it was not until six months later that he asked for her number on Scramble with Friends. 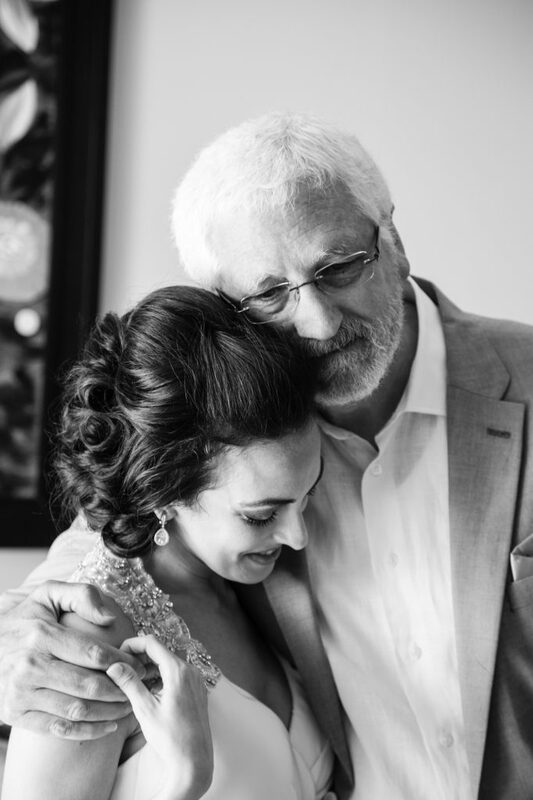 “He was sneaking around for weeks trying to surprise me (not easy to do) and told me we were going to his parents for a birthday dinner for him. 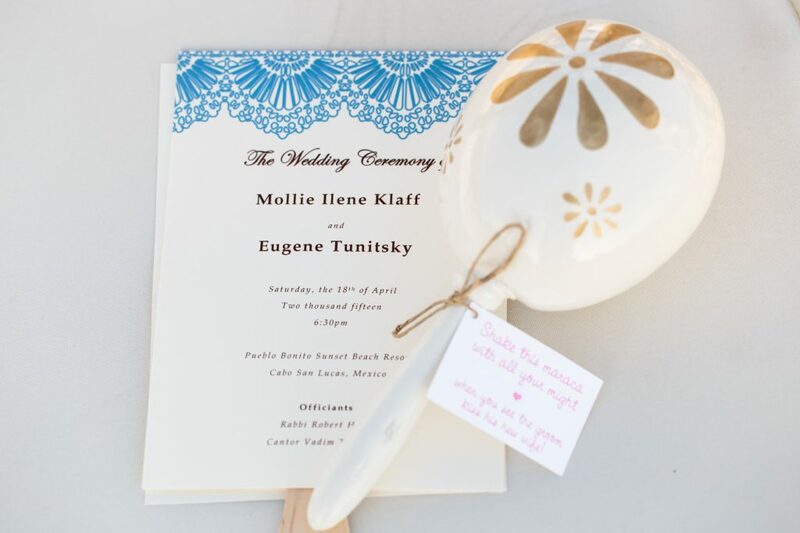 Mollie did not want a typical ballroom wedding and the idea of getting away and having a vacation for them and their friends and family sounded like a no brainer. 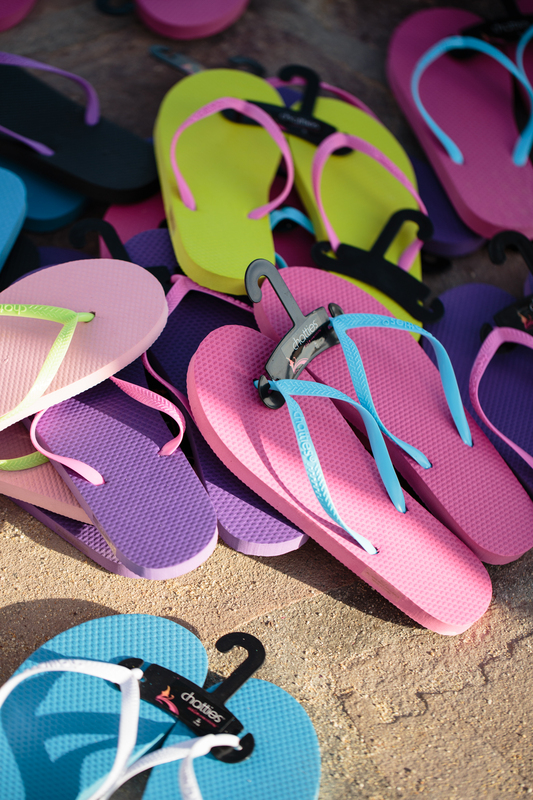 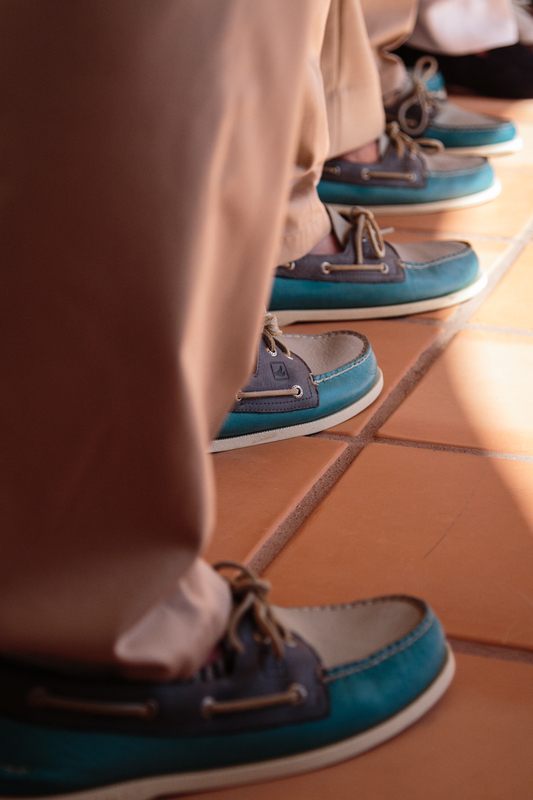 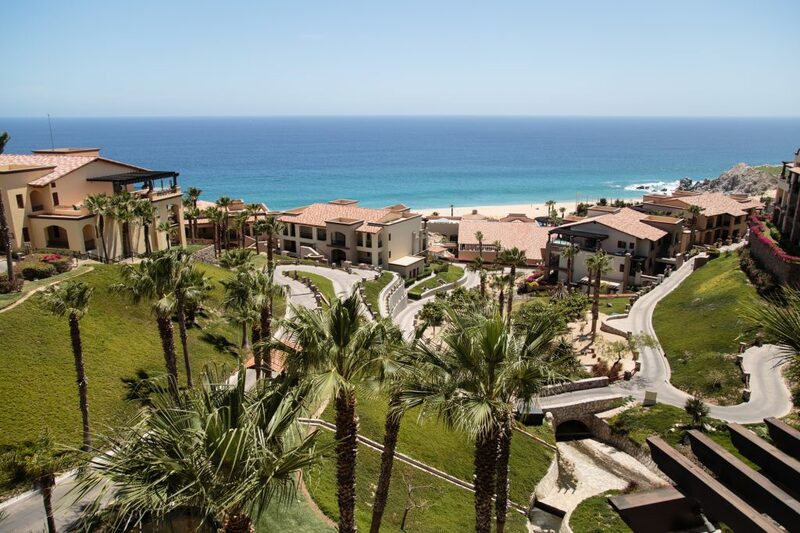 They both love Cabo and have spent time here before and knew it was the only option for them. 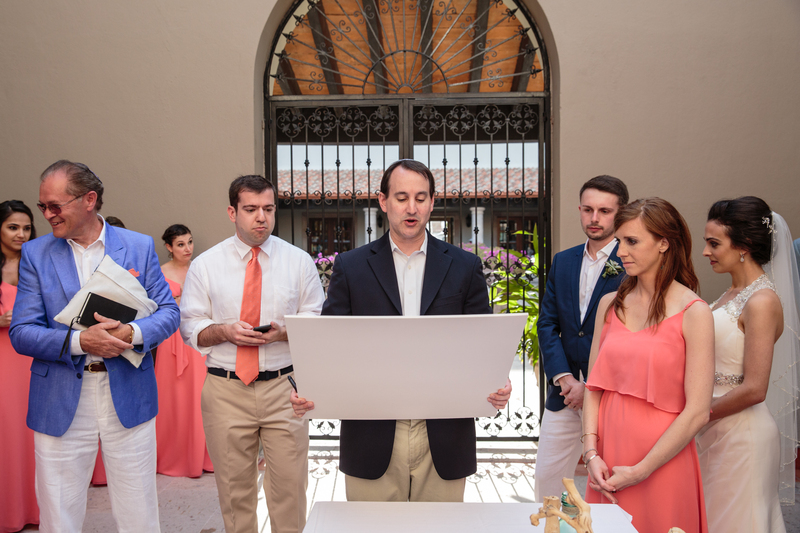 They opted for an intimate ketubah signing followed by the traditional Jewish ceremony at the beach in front of all guests. 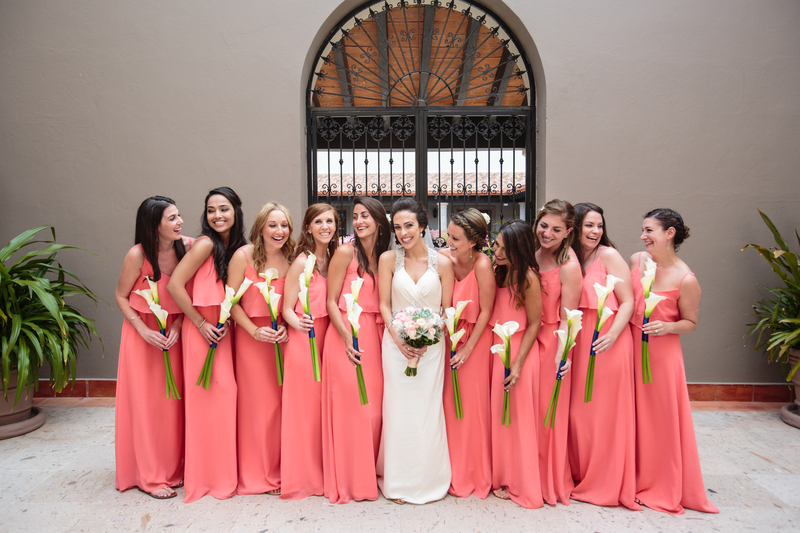 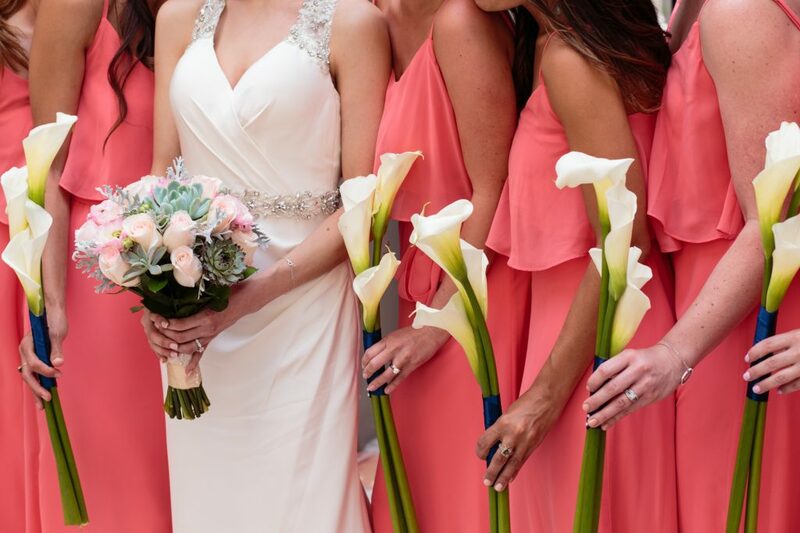 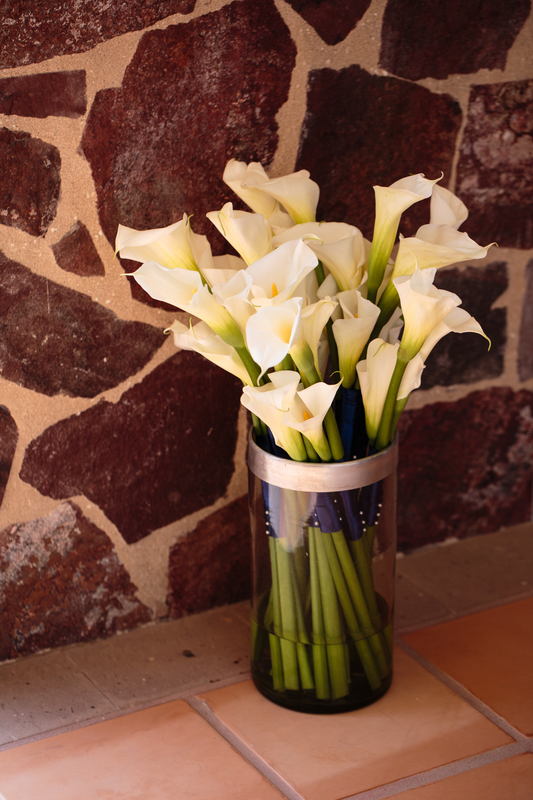 Bridesmaids wore light coral gowns with white calla lilies in straight bouquets for the ceremony. 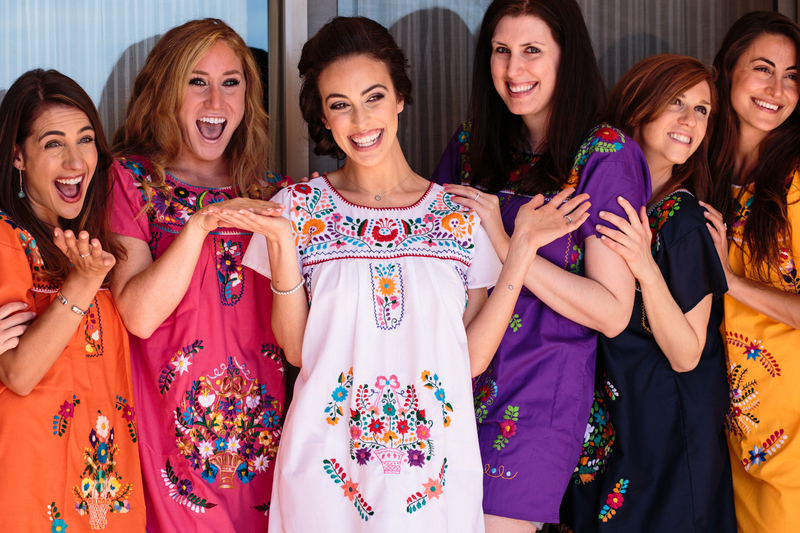 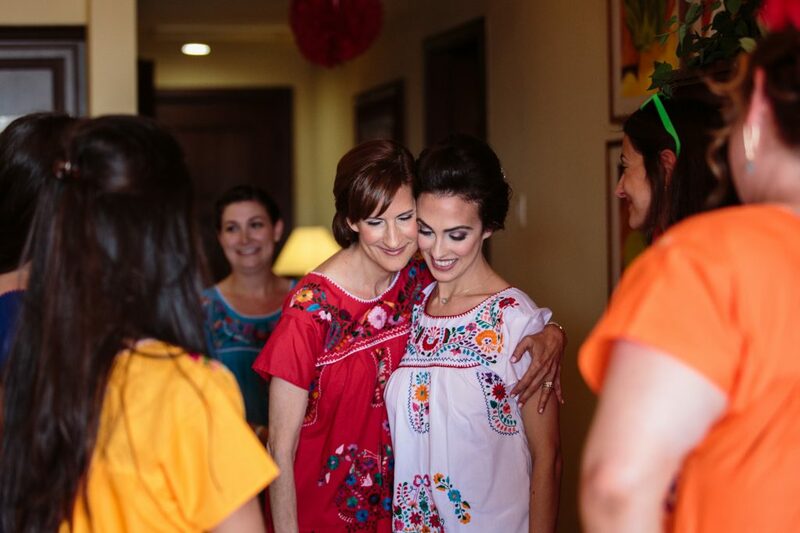 They received traditional Puebla Mexican dresses from Mollie each in a different color to wear while getting ready. 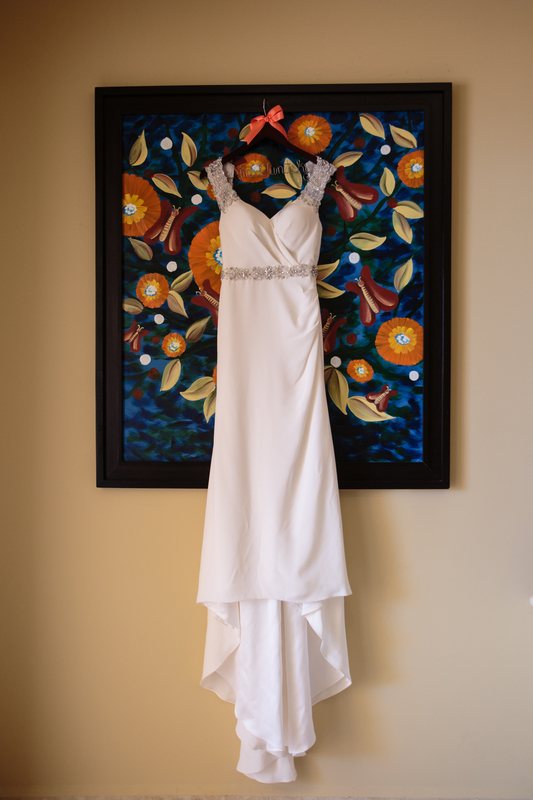 Mollie wore a column backless silk dress, with a lace embroidered with spangles in a delicate piece for the back. 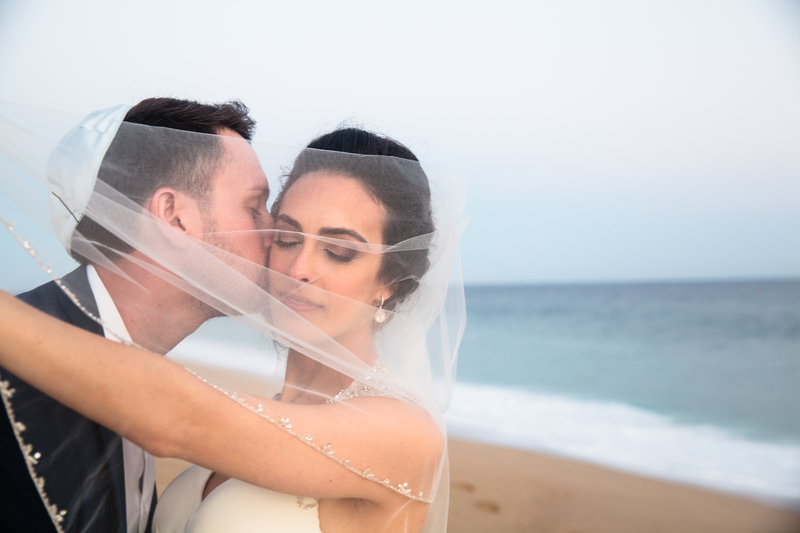 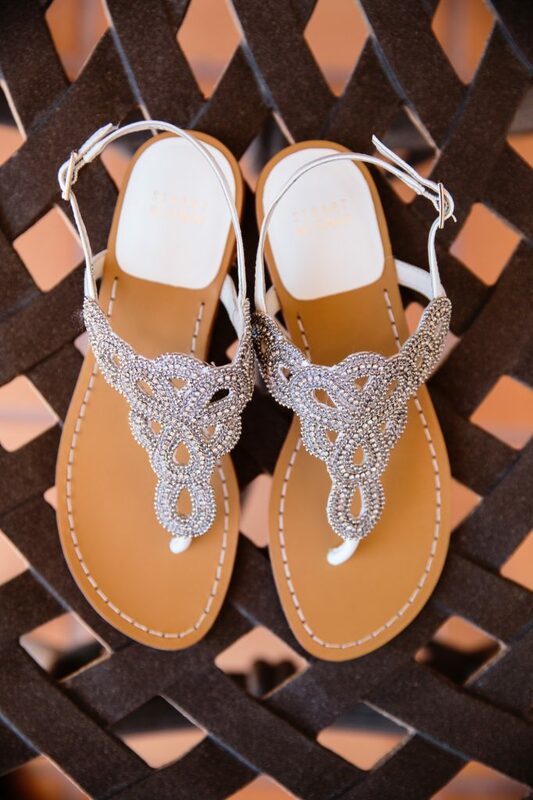 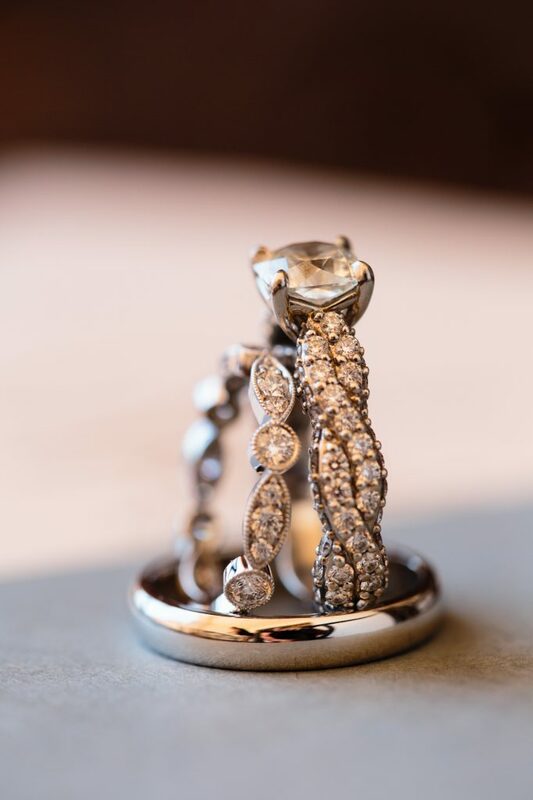 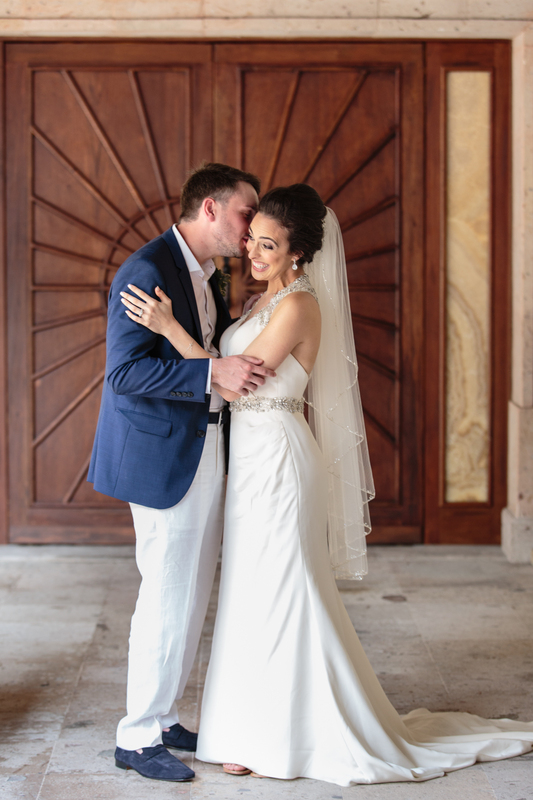 She was positively gorgeous, a bride with a touch of old Hollywood glamour and yet light and fun for a beach wedding. 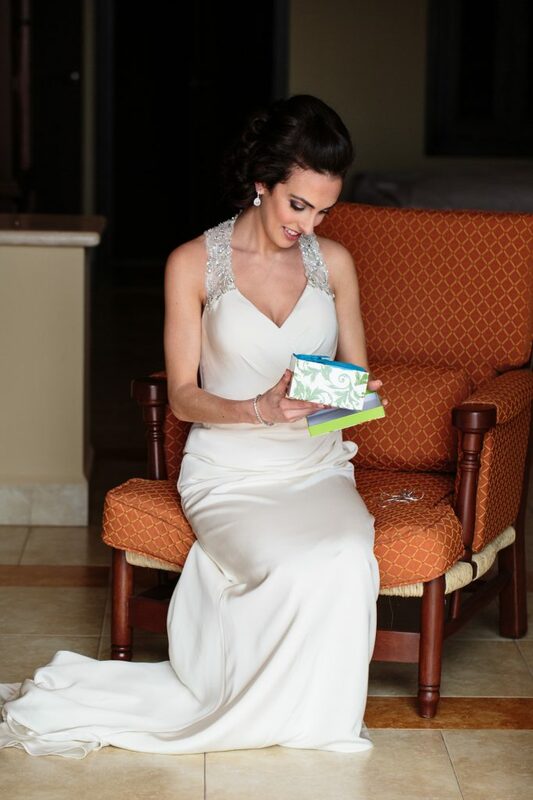 Her hair up and make-up was kept to a elegant and natural look by Neysa Berman at Blanc Bridal Salon. 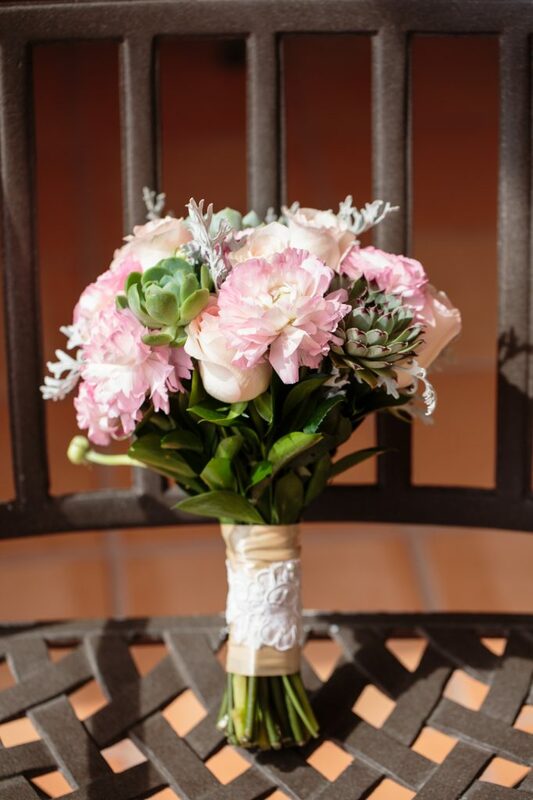 To complement the beach wedding dress, the wedding bouquet was a sweet mix of blush roses and peonies mingled with succulent flowers. 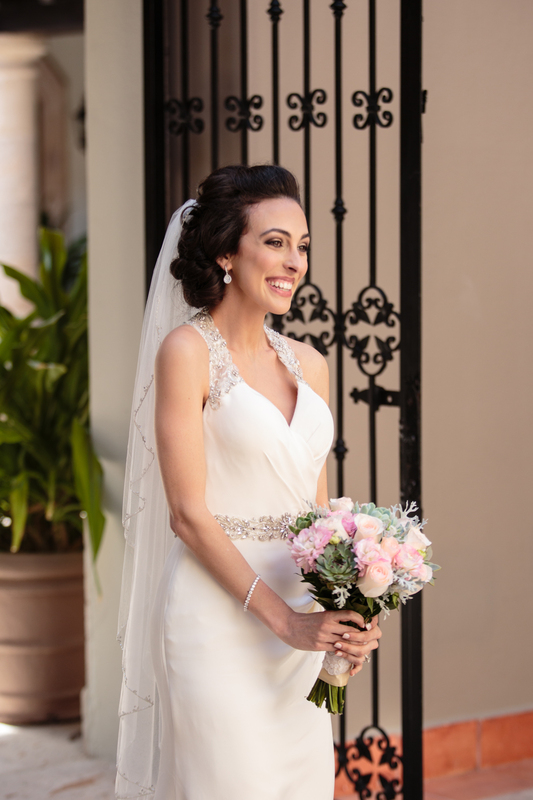 The bride quickly got dressed before opening a cute gift from the groom – a brand new camera with an adorable video of himself for a final message before the big moment. 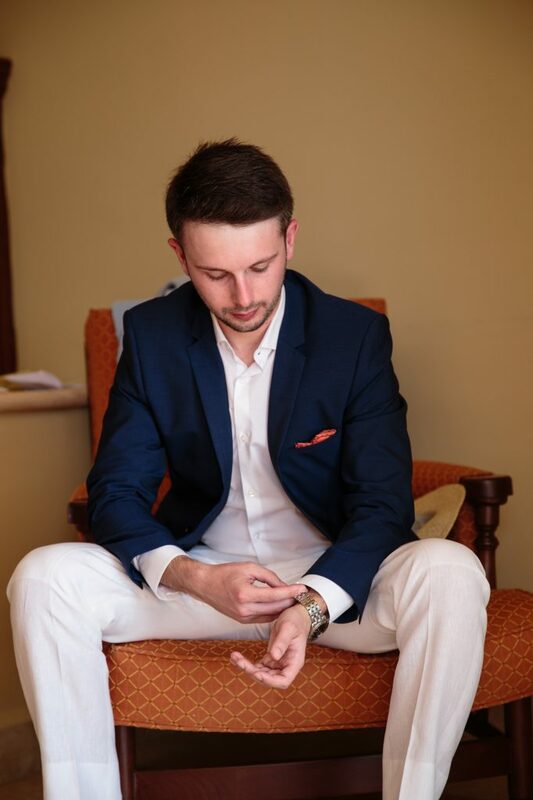 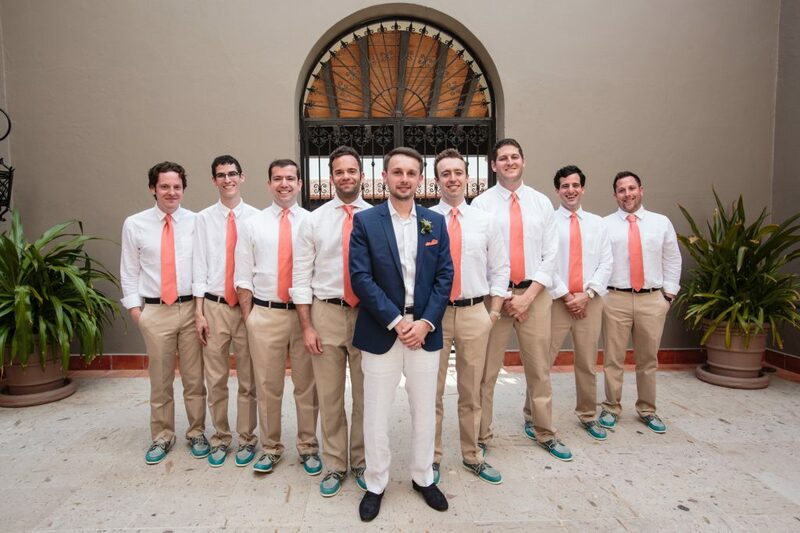 Ready and dressed, groomsmen wore a coral tie over a white shirt and no jacket, in contrast the Eugune in a blue navy jacket. Instead of wearing a tie himself, Eugene had a coral handkerchief and a succulent boutonniere. 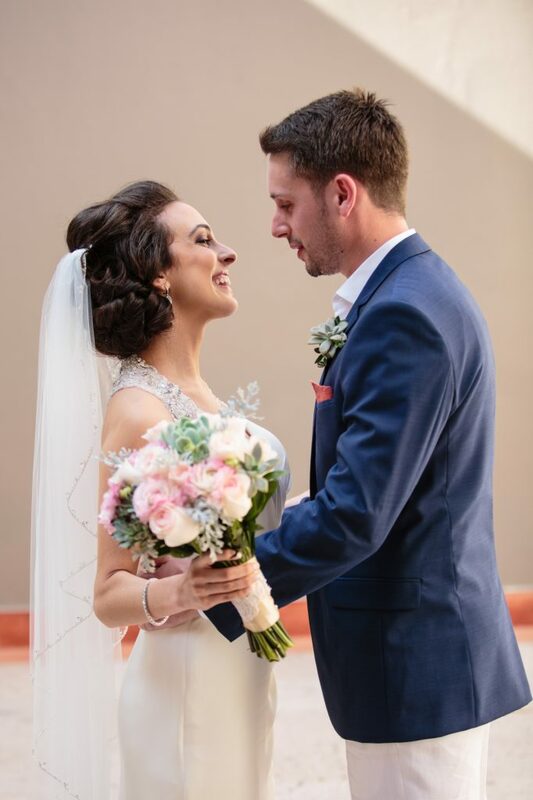 When bride and groom saw each other for the first time in their wedding attires, happiness was beating through the air. 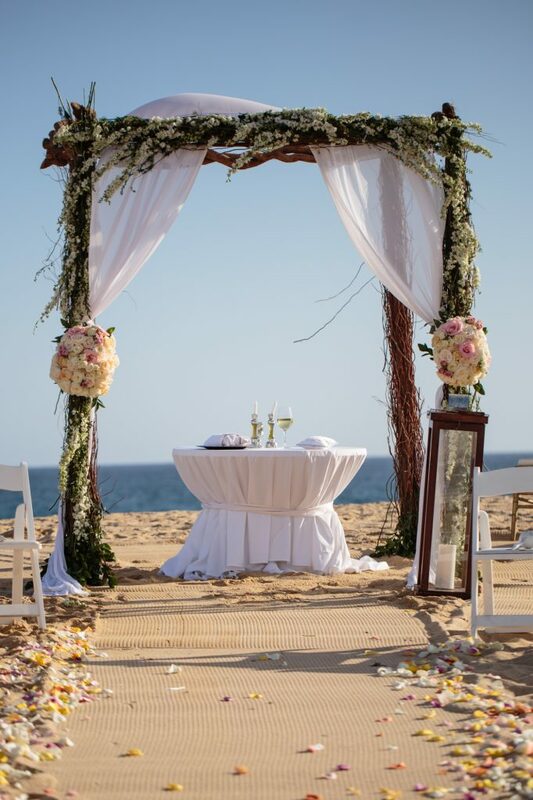 The seaside ceremony site had an amazing chuppah designed by Florenta’s Lola del Campo who worked a timeless arch using curly willow for texture and white delphinium, as well as multi colored roses arrangements. 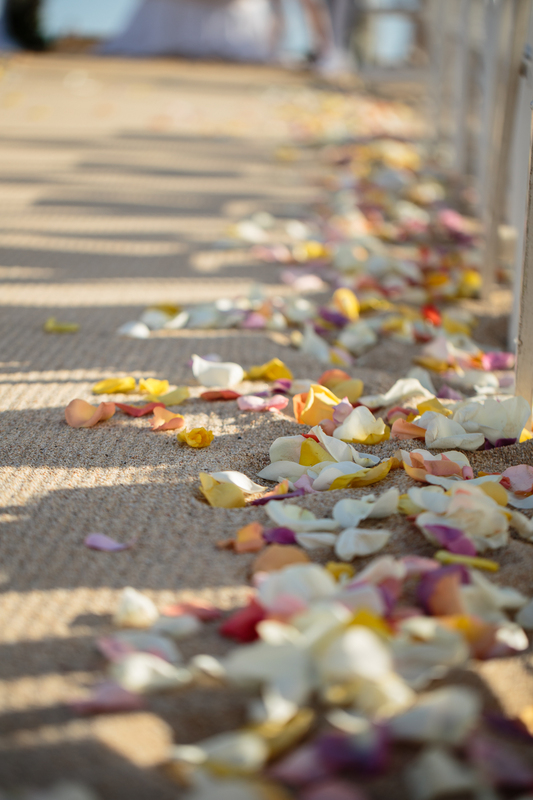 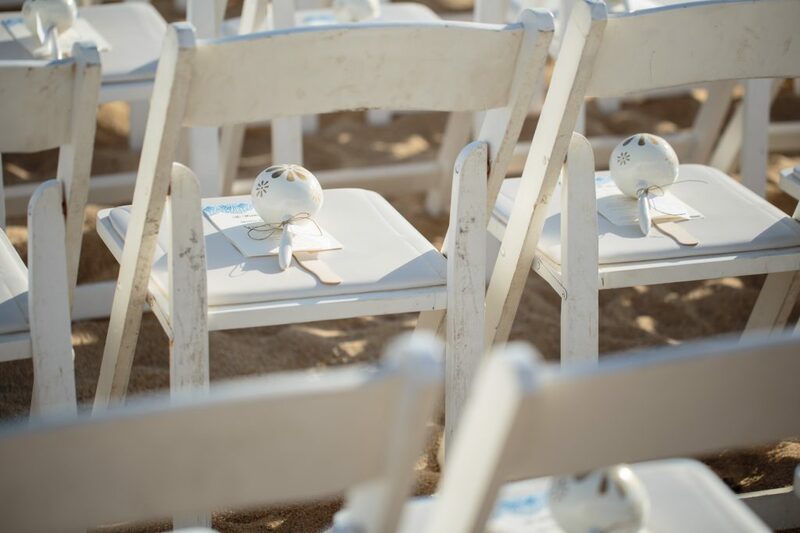 Petals were thrown on each side of the aisle and the chuppah was ranked by metal lanterns. 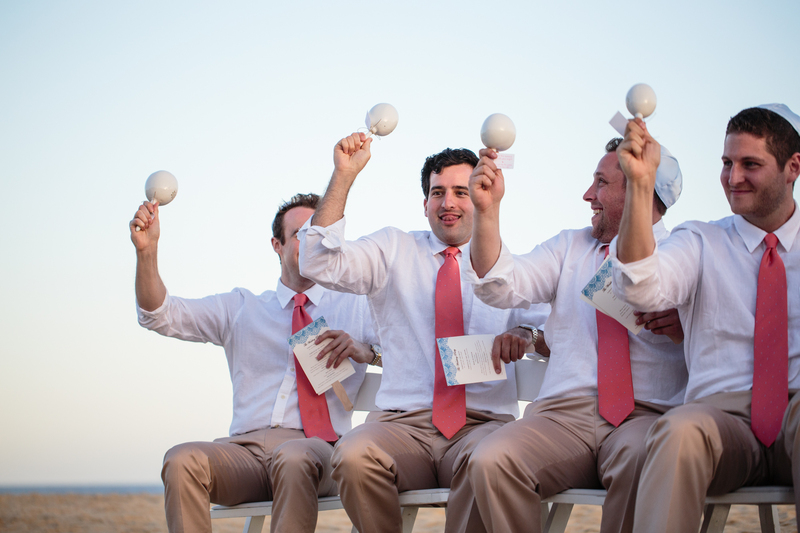 To celebrate the Cabo beach spirit, guests received white and gold maracas and a program. 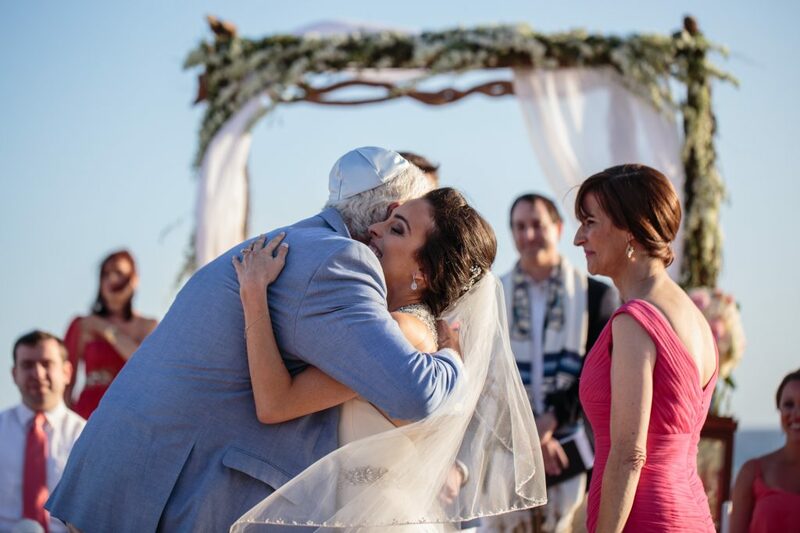 The rabbi officiated the ceremony supported by the amazing voice of the groom’s father who sang the sheva brachot, the seven blessings, throughout the ceremony. Parents flanked the chuppah. 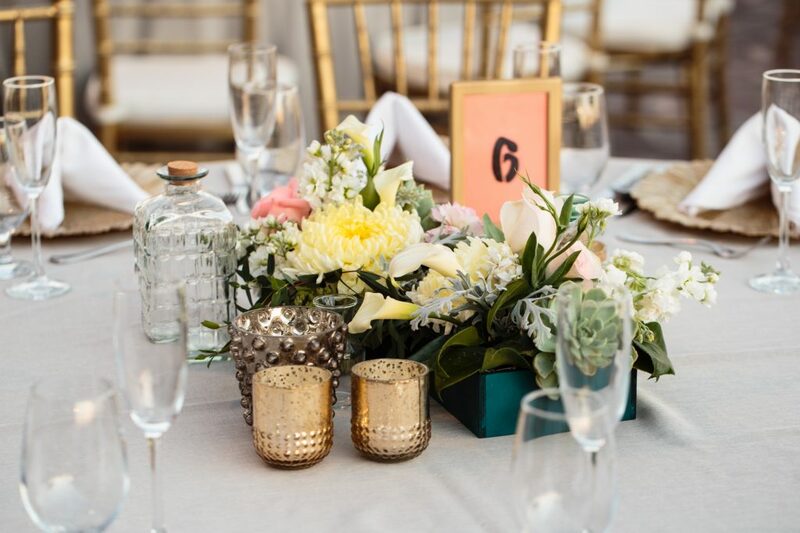 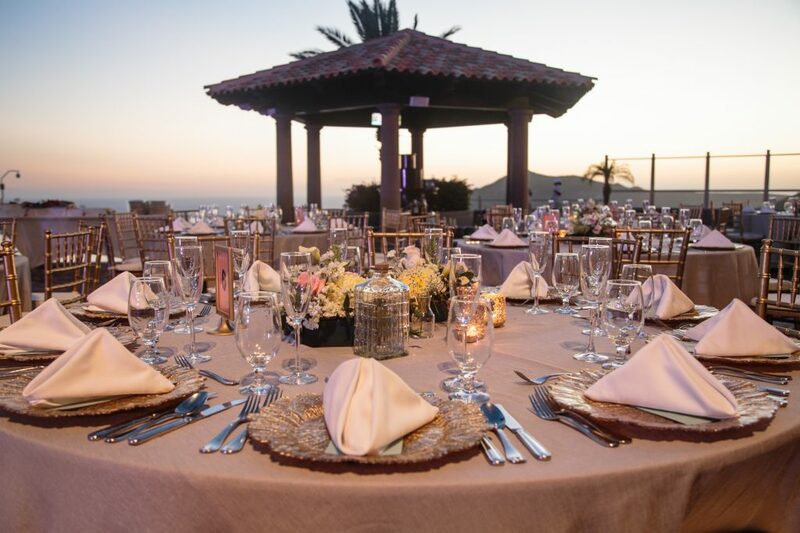 Reception was formed by round tables and golden chiavari chairs, golden dishes decorated with the menu and flower centerpieces surrounded by candle assorted holders in gold and silver glasses. 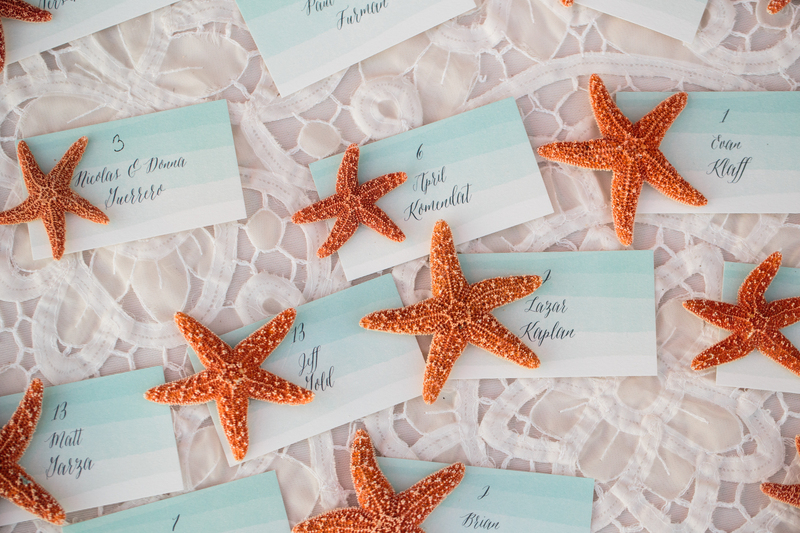 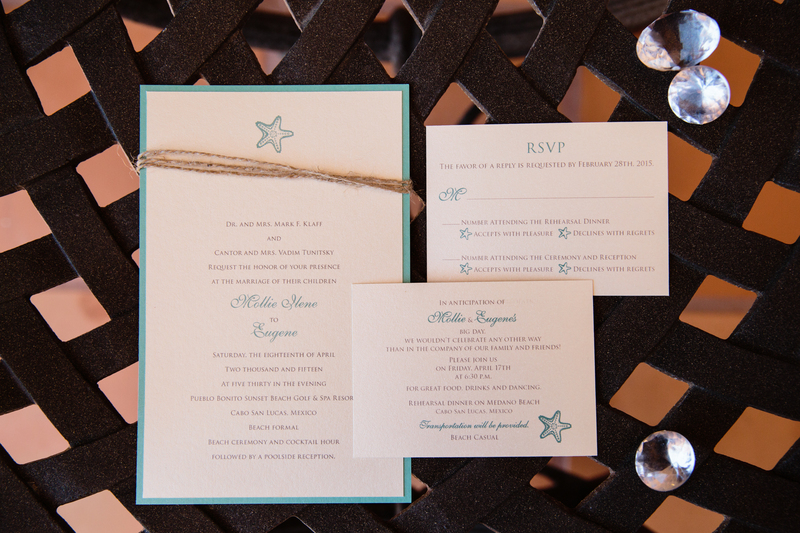 The seating chart was comprised of simple blue and turquoise cards tied with a starfish. 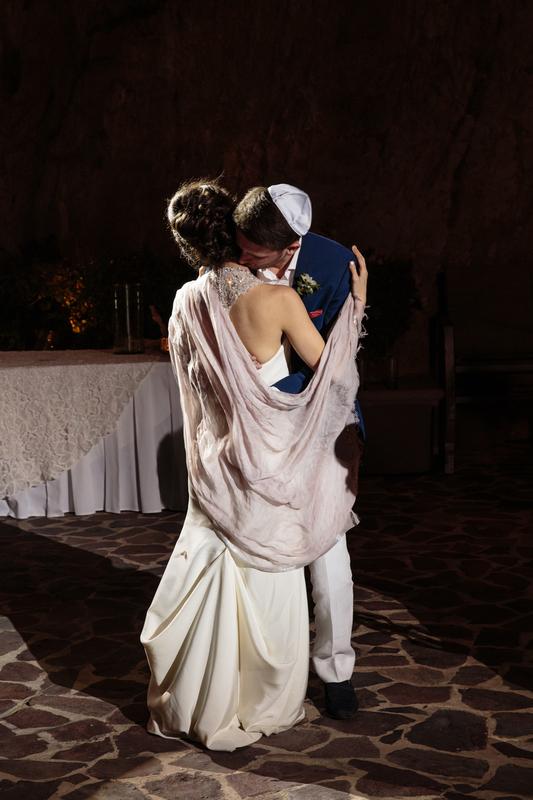 The local popular band Kilometro welcomed bride and groom for their first dance, followed by parent’s dances. 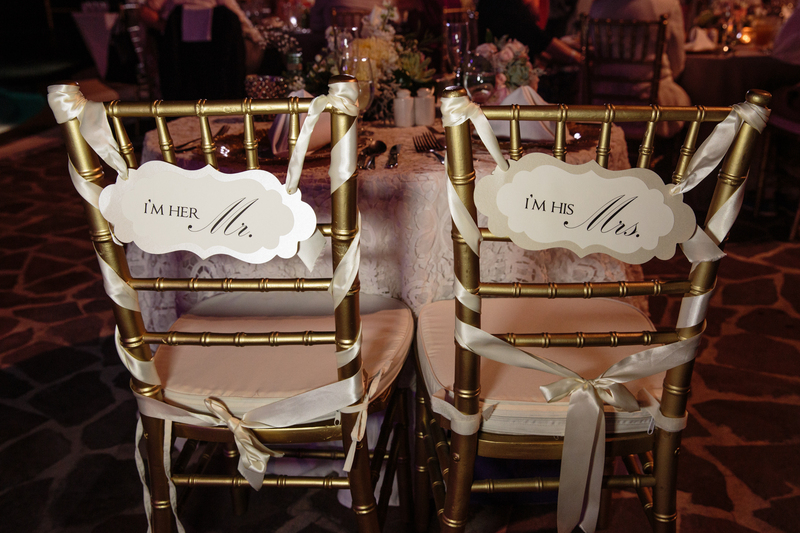 Dinner was filled with strong emotional speeches by parents of the couple. 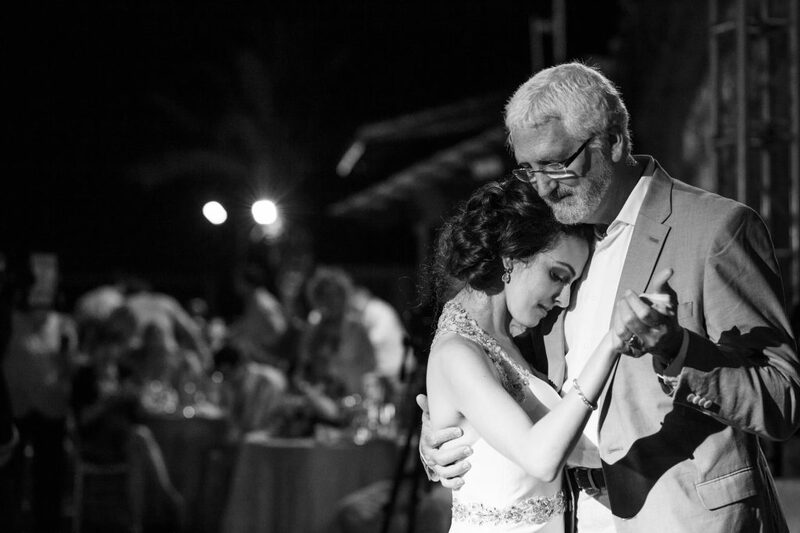 After dinner the party started with the hora. 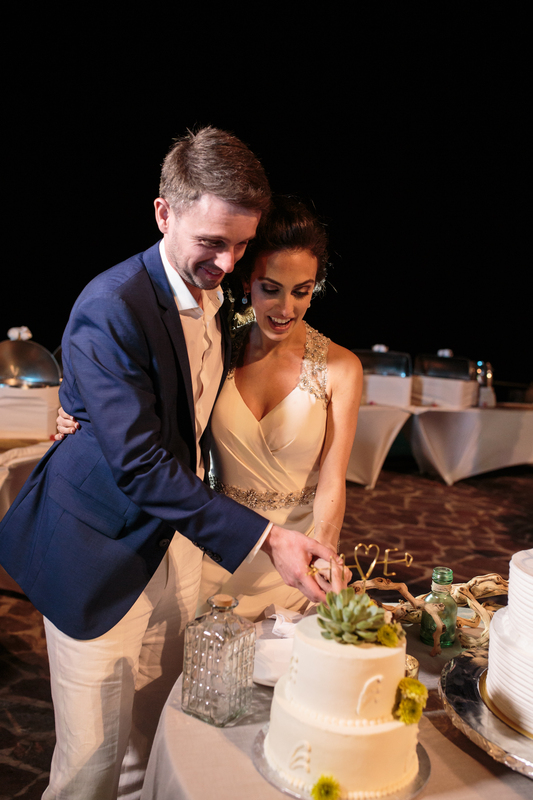 To close the night, cake cutting. 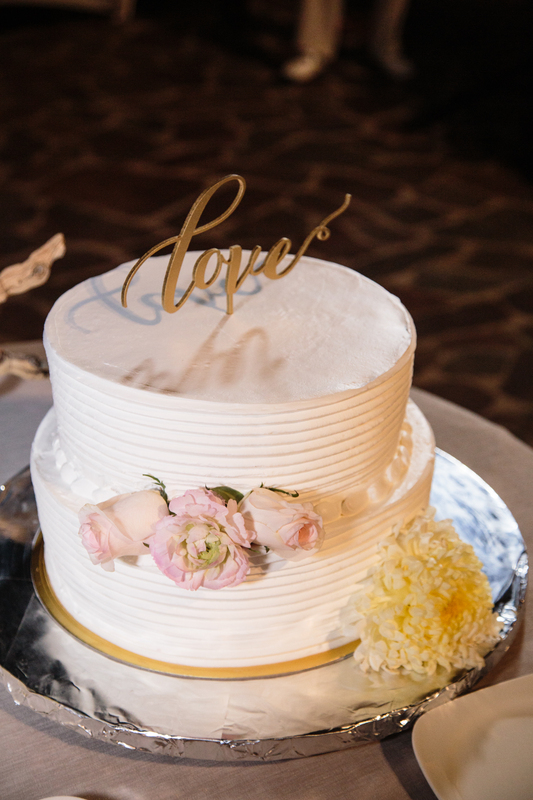 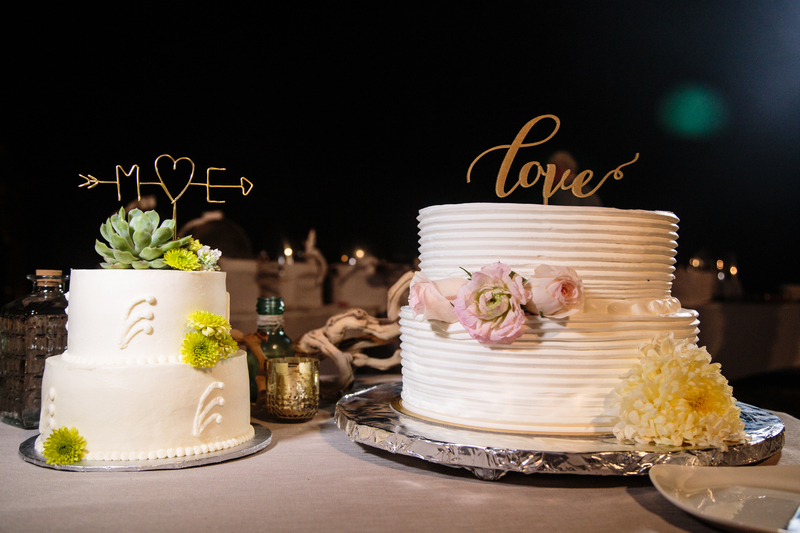 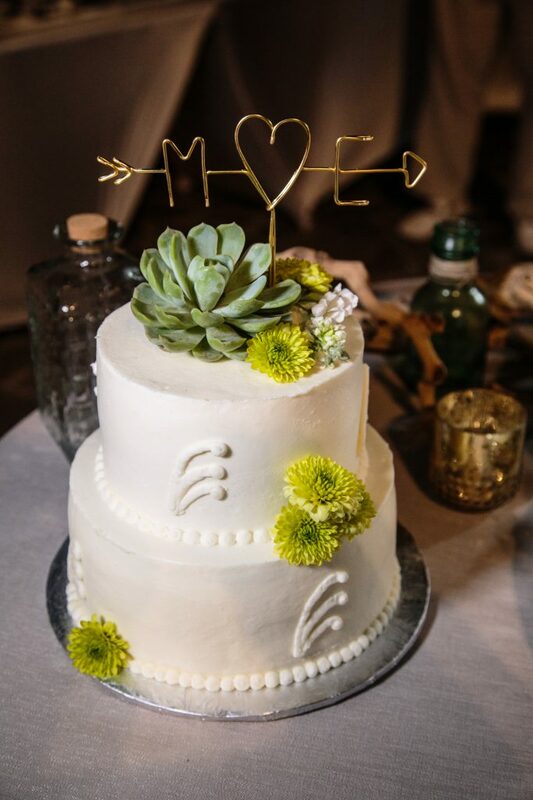 Bride and groom chose two different cakes in two different flavors decorated with flowers. 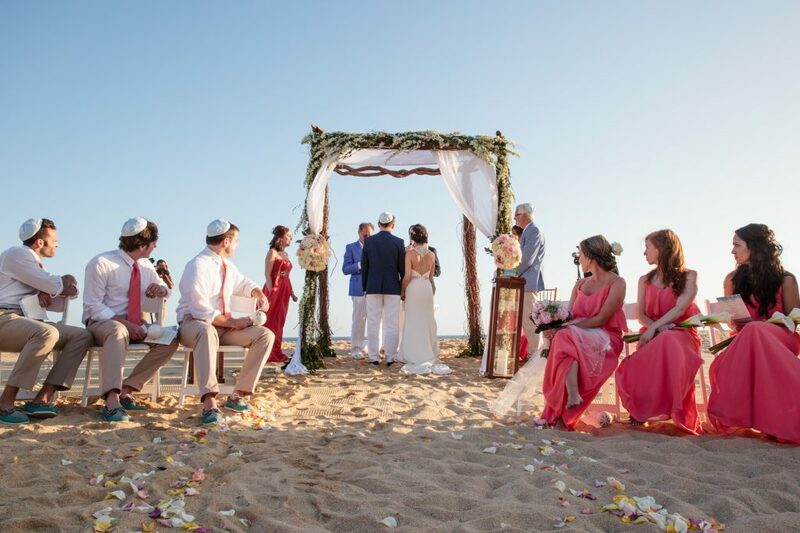 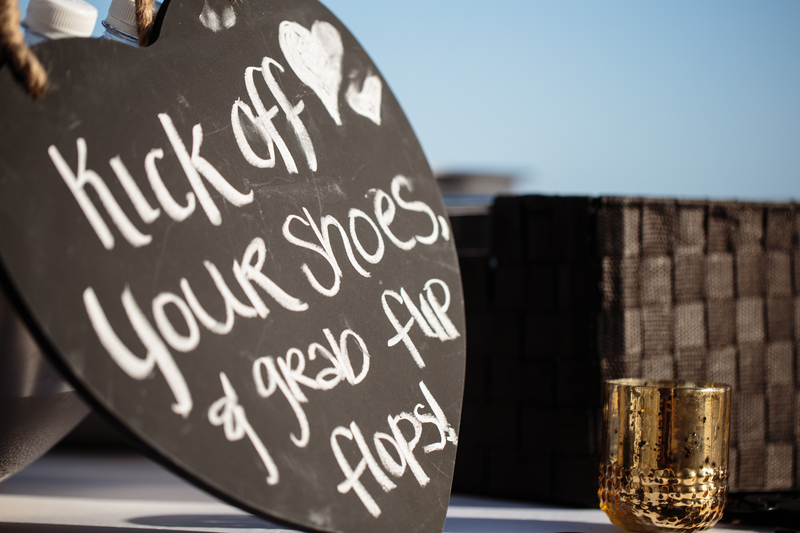 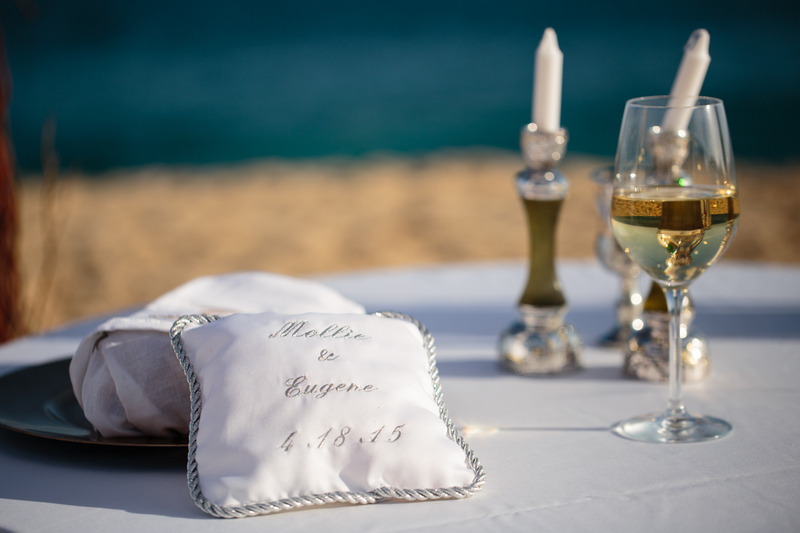 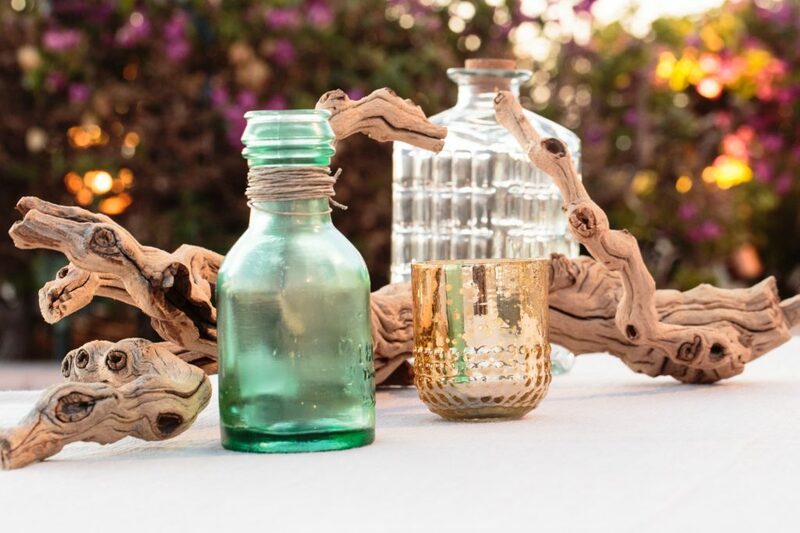 This entry was posted in Beach Jewish Wedding, Real Jewish Weddings.